Zuko and Katara. . Wallpaper and background images in the Zuko and Katara club tagged: katara zuko zutara waterbender avatar the last airbender firebender. 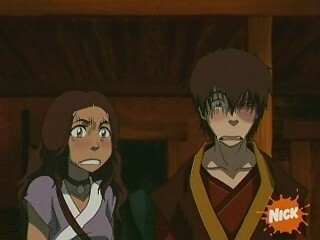 This Zuko and Katara Screencap contains anime, banda desenhada, manga, desenhos animados, mangá, and quadrinhos. That is funny!! and perfect! DUDE, that face is PRICELESS!